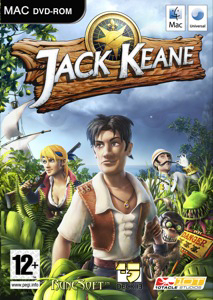 Jack Keane is a hilarious, action-packed adventure game in the spirit of Monkey Island, with tons of references to well-known computer games and classic movies. Players assume the role of our hapless, swashbuckling adventurer and accompany him in his travels across 15 locations throughout London, Capetown, and Tooth Island. Spectacular graphics, including dynamic lighting, realistic water, and particle effects, highlight your adventures. In colonial England, under a certain amount of duress, Jack takes on a job which will not only cause him a great deal of trouble, but also bring to light the answer to a mystery out of his distant past. A lack of money leads Jack to accept a charter to take a British secret agent to mysterious Tooth Island. When Jack's ship shatters on the mysterious island's cliffs on arrival and the secret agent quickly becomes a meal for a monster in the jungle, Jack is soon left to cope with the situation on his own. Interact with dozens of zany characters and use more than 250 found objects to solve puzzles, as Jack moves closer to solving the mystery of his past and how it ties in with the present.